AvailabilityItems ship from multiple locations and may arrive at different times. Advance Orders Only. Please review the product description for complete details. Get all the professional features of the Brother DQLT15S while free-motion quilting from the comfort of your favorite chair. The space-saving sit-down table is perfect for smaller quiting rooms, and still gives you the advantage of a full 15” throat length. High-quality craftsmanship and welded steel legs provide for enhanced stability. Shown with Optional Luminess 5 foot overhead lighting bar (Add under Recommended Accessories below). Get all the power of the Brother professional features while free-motion quilting from the comfort of your favorite chair. The space-saving sit-down table is perfect for smaller quiting rooms, and still gives you the advantage of a full 15” throat length. High-quality craftsmanship and welded steel legs provide for enhanced stability. The sit-down version of the Qnique Quilter includes a multi-function foot pedal. Besides controlling the stitching speed, you can press the “back kick” button to raise or lower the needle. You can even change the default needle stop position by holding the back kick down for three seconds. The needle plate in the sit-down table gives you direct access to your bobbin for easy changes and adjustments. 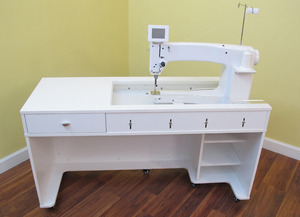 Both the sit-down table and the sit-down version of the quilting machine include easily adjustable leveling feet. Increased stitch speed, extended throat space, advanced control settings, and so much more; the Q'nique long arm quilting machine is truly the most economical long arm quilting machine on the market! Quilting Controls: The Q'nique long arm quilting machine was designed to be as user friendly as possible. There is no need to reach around the machine to adjust the hand-wheel, stitching faster or slower. Learn how to set the tension on a sit down longarm quilting machine like the Grace Qnique 14+ in this quilting tutorial with Leah Day. Follow Leah for more quilting fun! 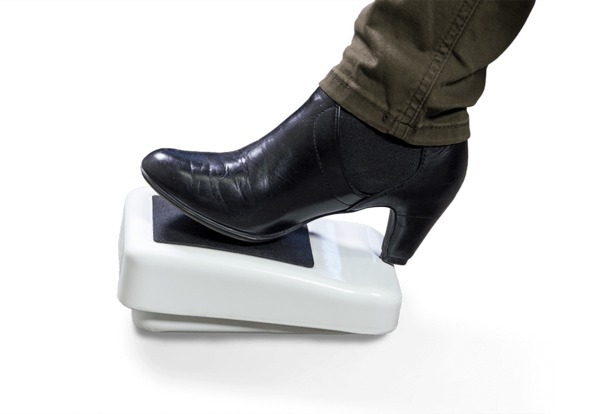 MULTI-FUNCTION FOOT PEDAL. The sit-down version of the Q’nique 14+ includes a multi-function foot pedal. Besides controlling the stitching speed, you can press the “back kick” button to raise or lower the needle. You can even change the default needle stop position by holding the back kick down for three seconds.